Mice droppings are gross. If you live in some places (like the Southwest of the U.S.) they can be more than gross. They can lead to a dangerous virus called hantavirus. This infection is spread by rodents, especially their droppings. And although contracting the virus can be serious, you can take a few simple steps to reduce your risk. It's a virus that can, in its worst form, make it hard to breathe. It can progress into a disease called hantavirus pulmonary syndrome. Hantaviruses are part of the bunyavirus family of viruses. All the other viruses in this family are spread by arthropods (like insects) except for the hantaviruses. These are RNA viruses. 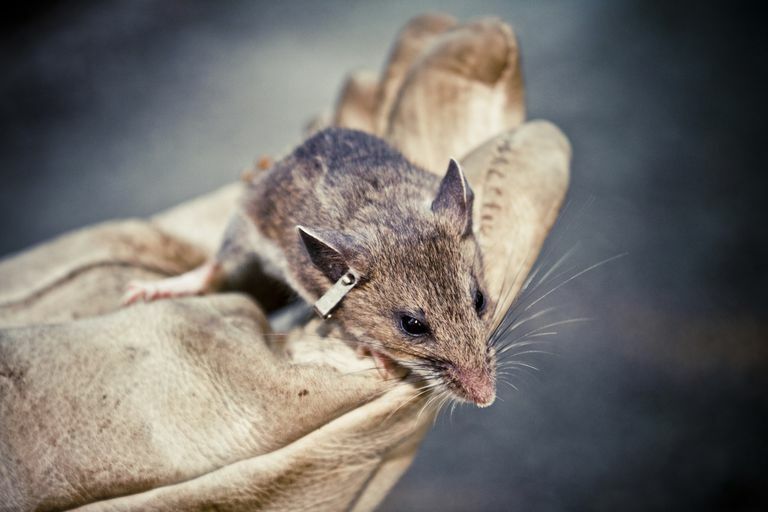 Most people who get hantavirus become tired, have a fever, and experience muscle aches. The muscles that ache the most are the large muscles, including the thighs, hips, back, and sometimes shoulders. Some who get sick can also experience headaches, chills, and dizziness, as well as nausea, vomiting, diarrhea, and/or abdominal pain. About half who go on to get sicker have these symptoms. Some go on to develop more severe symptoms. This happens about 4 to 10 days after the first symptoms start. The severe symptoms include difficulty breathing and coughing. At this point, the lungs can fill with fluid making it hard for patients to breathe. It probably takes one to eight weeks from being exposed to rodents (or their droppings) to getting sick. Of those who develop Hantavirus Pulmonary Syndrome, around 3 to 4 in 10 people die (that's 36 to 38 percent of people). However, not many people have developed HPS. It's a rare disease. From 1993 to the beginning of 2016, there have only been 659 cases identified in the U.S. Before 1993, the disease was not formally recognized (though cases have been identified retrospectively, which brings the total to 690). How Do You Get Hantavirus? You get hantavirus from rodents. Mice and rats with the virus don't get sick. They can scurry about and shed the virus through their urine and droppings. The virus can also spread through their saliva, meaning anything they gnaw on for food or nesting can carry the virus. In the environment, the virus can last for several days in drying droppings, urine, and saliva. This can be from cleaning up a storage room where mice or rats have made a nest out of magazines. It can be from hiking in an area and camping in an area that's infested. It can be from cleaning up a couch, where mice have burrowed into cushions. It can be from sweeping and sending up droppings and other particles into the air, which can then be breathed in. It can also be from cleaning out a summer cabin after a long winter when only mice have been inside for that time. In other words, there are many, many ways to come in contact with bits of material contaminated by infected rodents, if rodents are infected. Fortunately, most places don't have infected mice or rats. Hantavirus has most commonly been found has been in the Four Corners area of the United States. This includes Arizona, New Mexico, Colorado, and Utah, as well as the Navajo and Hopi nations in the area. Rarer cases have occurred in other nearby states: California (including Yosemite National Park), Washington, Texas, Montana, Idaho, Kansas, South Dakota, North Dakota, and Oregon. There have been cases of similar hantaviruses in other U.S. states. In Louisiana, there is the Bayou virus carried by the rice rat. In Florida, there is Black Creek Canal virus. In New York, there was a case of a virus now named the New York-1 virus. The illnesses caused by these similar viruses are not always quite the same, but there have been similarities. Others have become sick with related hantaviruses in Argentina, Brazil, Canada, Paraguay, and Uraguay. There are other more distantly related hantaviruses in Europe and Asia that cause a worrisome, but different illness: hemorrhagic fever with renal syndrome (HFRS). This is primarily caused by the Puumala virus (PUUV) found especially in Finland and Sweden, as well as forested areas of Belgium, Germany, and the Netherlands and spread through voles. It can also be caused by the Tula virus (TULV), Hantaan virus (HTNV), and the Seoul virus (SEOV). Even in states and countries where there is Hantavirus, not all mice and rats will be infected. Only certain species can carry Hantavirus and specific viruses are specific to specific rodents. These rodents are usually found in only certain environments. There are different types of mice and rats that can spread the virus. Different rodents spread different strains of hantavirus. The deer mouse can spread the virus (Sin Nombre SNV strain). They live in woodlands in North America, but can also be in desert areas and in homes and cities. The cotton rat can spread the virus (strain Black Creek Canal virus BCCV). They live in the southeastern US and into Central and South America. They live in overgrowth (shrubs and tall grasses). They can also make it into cities if the conditions are right. The rice rat is a smaller rat that spreads another strain called the Bayou virus. It is also in the southeastern US and Central America. It lives in marsh areas and can swim. The white-footed mouse looks a lot like a deer mouse but carries a different virus (New York virus NYV). It is in the eastern part of the US, from the southern part of New England to Mid-Atlantic states (NY and NJ) down to southern states. It can also be found in the Midwest and the West of the US, as well as in Mexico. It lives preferably in wooded or bushy areas but can live in other parts as well. There are likely other rats and mice that carry Hantavirus that can lead to HPS but they haven't been found. There are definitely other viruses that carry similar viruses that cause another Hantavirus illness: HFRS (hemorrhagic fever with renal syndrome). Although there are many ways to be exposed, remember that hantavirus is rare. Additionally, there are many steps you can take to stay safe. First things first, avoid rodents, droppings, urine, and anything they may have chewed or eaten. Also, avoid places they may be: abandonded cabins, unused storage rooms, known infested areas, barns, or other areas. Store food inside rodent-proof containers or in the refrigerator or freezer. Make sure to seal up any holes in the walls or flooring where rodent could enter. In other words, just make it hard for mice or rats to get into where you live and make it unlikely that they'd want to stay. This holds true for where you go camping and where you work. Do not sweep, vacuum, or high-pressure spray droppings, urine, nesting, or other potentially contaminated materials. This can throw contaminated material into the air which can be breathed in. Avoid cleaning anything indoors, if at all possible. It is better to clean equipment or anything else outside. Sunlight's UV light and fresh air can reduce your risk of the virus. It is best for droppings, urine, and other contaminated material to be wet thoroughly with a disinfectant like a chlorine solution or Lysol. Using rubber, latex, vinyl, or nitrile gloves and washing your hands with soap and water can help best you safe. Many who become sick had exposure to rat or mouse droppings, but not all knew that they are coming in contact with rodents or their droppings. Be mindful if you're in an area that may have mice or droppings. If you might be exposed to infectious materials, you should follow the guidelines provided through the CDC in the US, the Canadian government, and the U.S. military. Can You Get Hantavirus From Someone? Transmission of Hantavirus has not been seen to occur from one person to another in the US. A related Hantavirus, the Andes Hantavirus, has been shown to spread in health workers in Chile and Argentina, but rarely. Patients are often treated without knowing what disease they have at first. There may be delays in diagnosis, especially if it is not suspected. Patients may be treated with antibiotics for other infections, like leptospirosis, which can cause a similar disease and is also spread by rodents. Hantavirus, however, is a virus and does not respond to antibiotics. Medical professionals in affected areas may suspect Hantavirus if someone has certain signs and symptoms. Affected patients usually have a fever and a sudden onset of problems breathing. They may initially have had fever, chills, muscle aches, headaches, and GI upset. The disease then develops quickly; a young healthy person may need oxygen within 2-3 days of seeking medical help. The disease can cause severe lung problems that requires oxygen and can be seen to affect both lungs on X-Ray (or on exam). Labs may show “hemoconcentration” (a rise in red blood cells, the opposite of anemia, that can occur when someone is dehydrated). Labs may also show a high white count (neutrophils) and low platelets (thrombocytopenia). separate this infection from others for doctors. The disease, if suspected, can be confirmed by laboratory tests. There are antibody tests (IgM or rising IgG titers) and a PCR test. Lab testing is not usually available at most hospitals. It should be sent to a reference laboratory. In 1993, an outbreak of a virus that became known as "Sin Nombre" ("without name") suddenly surprised residents and health professionals in the Southwest of the U.S. Young healthy adults suddenly became sick, unable to breathe, and no diagnosis could be found. From April to May 1993, there were 24 cases identified. Twelve of these people died. Eventually, the diagnosis was made and it was found to be due to a type of virus called a hantavirus. Other types of hantaviruses had previously been identified elsewhere, such as in Korea, before, but this was a new species (Sin Nombre Virus) in the known genus of hantaviruses. The syndrome became known as hantavirus pulmonary syndrome. Interestingly, the virus was not brand new. It was just the first time the larger medical community recognized this disease. Looking back at old samples in the area found that there were people who had died without a diagnosis had actually had Hantavirus. The earliest case identified by testing saved samples was from 1959 in a 38-year-old man from Utah. Even earlier recognition of the disease comes from Navajos in the Four Corner Region. Navajo medical practices recognized a similar disease associated with mice, apparently for many years prior. Simply put, this outbreak occurred because there were more mice. This had a lot to do with climate. There had been a drought for several years. Mice and their predators dropped in number. Heavy snow and rain then came. The mice increased in number and more mice came in contact with people. Additionally, in the summer and fall of 2012, ten cases were confirmed in those who had recently visited Yosemite Park. Castillo C. Prevalence of Antibodies to Hantavirus Among Family and Health Care Worker Contacts of Persons With Hantavirus Cardiopulmonary Syndrome: Lack of Evidence for Nosocomial Transmission of Andes Virus to Health Care Workers in Chile. Am J Trop Med Hyg. 2004;70(3):302-4. Wells RM, Young J, Williams RJ, et al. Hantavirus Transmission in the United States. Emerging Infect Dis. 1997;3(3):361-5. The Lujo Virus: How Is It Similar to Ebola?